To many in the US, Chicago is the quintessential Democratic city. Indeed, the last Republican mayor of Chicago was “Big Bill” Thompson in 1931. But under the surface of that solid stretch of Democratic control are stories of power struggles and corruption that make Chicago’s politics legendary. My hope is that this hat spurs conversation across the entire political spectrum in Chicago; i.e. from the Machine, Neoliberal/business, and Progressive Democrats, to our Republican, Libertarian, and Socialist or Communist neighbors. All proceeds will go to some charity or cause, I don’t need your $15 (and I think Pilsen needs a wrestling team). 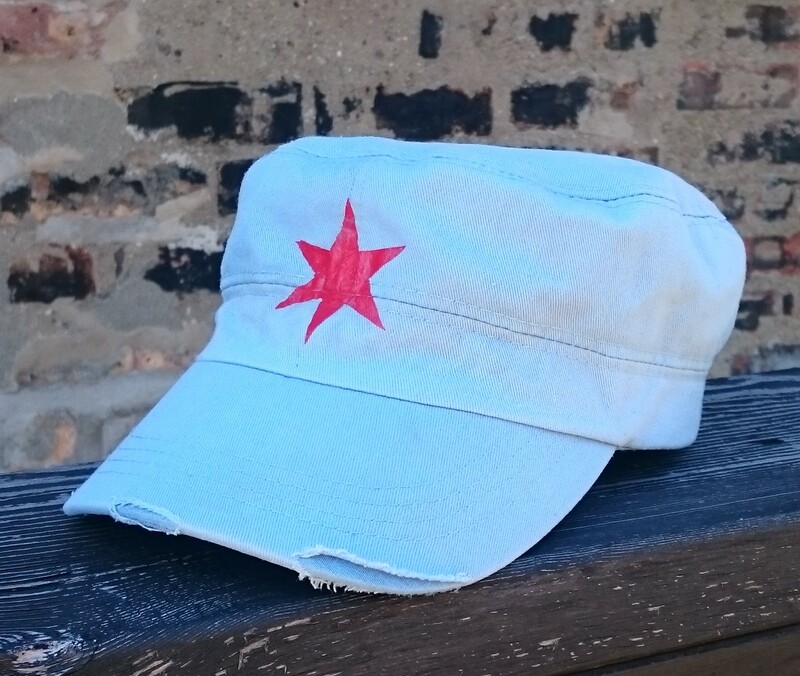 This hat is inspired by the design of the Chinese Army cap with the difference being that the Chicago Cadet Cap bears the signature light blue and six-pointed red star of the Chicago flag. I consider this an art project in that it is inspired by the parallels between Chinese and Chicago politics. I held a post-doctoral position at Tsinghua University in Beijing, China 3 years ago. Before leaving for China, I studied its long history. This is 50th anniversary of the Cultural Revolution. I’ve had this design idea for some time, but this weekend’s Cultural Revolution Propaganda Poster Art Exhibition spurred me to action. The history of violence, success of political propaganda, and profundity of the era may hold some lessons for us today. 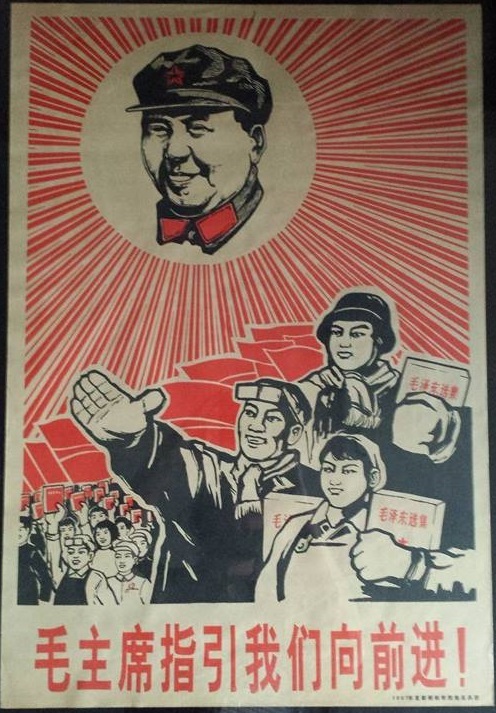 Here’s a poster I picked up in Beijing of the kind being discussed tomorrow (Mao’s wearing the hat!). The contradiction of Communism and for-profit enterprise that now exists in China is explained away by the all-powerful Chinese Communist Party (CCP) as “Communism with Chinese Characteristics”. This mirrors some of the un-Democratic actions and behavior I’ve seen from the all-powerful Chicago and national Democratic party. There’s the racism directed to me by a local “progressive” church and my previous employer who are Democratic operatives with a history of diversity problems… and then the racism directed at our current president by our future president in questioning his “American roots”; classic dog-whistle racism. We have a pension crisis created by utilizing the right-wing “Starve the Beast” strategy. There is the rejection of established science by Rahm’s regime regarding lead in our water in much the same way Republicans reject climate change. There is the lack of ballot access that forces one to become a full-time politician just to run for office, and the quickness to sell out your cause to advance that career that naturally follows. There is the endless privatization of schools and other social services that would make both the Republicans and Chinese blush. And let’s not forget our Mayor himself who jumped on the New Democrat train back in the first Clinton presidency. The history starts with Richard J. Daley (and even before that). Then it evolves in the 80’s with Harold Washington, the Council Wars, and the rise of Reagan which prompted a response by national Democrats to sell out their New Deal past to Wall Street for campaign cash. The rise of Richard M Daley moved us toward the New Democrat model, especially as his brother Bill Daley moved up at JP Morgan Chase and eventually did the docey-doe with Rahm and Richie as Mayor and Chief of Staff for Chicago and Obama respectively. The last municipal election appeared to cause a split between the old-school Machine Democrats and the Neoliberal Democrats as the working class Machine Democrats started to realize that their wealth disappeared to Wall Street and nothing was going to be done about it. So there you go. Plenty to talk about at the bar with your awesome new hat. Just shut up when the game comes on.